16 audio CDs, booklet, etc. Learn Spanish the Easy Way — Just Listen! You’ll be speaking and understanding in no time flat! Spanish I, Comprehensive includes 15 hours of spoken language practice and one hour of reading instruction in thirty, 30-minute lessons. You’ll cover the basics: saying hello, asking for or giving information, scheduling a meal or a meeting, asking for or giving basic directions, and much more. You’ll be able to handle minimum courtesy requirements, understand much of what you hear, and be understood at a beginning level, but with near-native pronunciation skills. 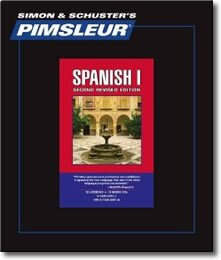 Reading Lessons are included at the end of Unit 30 to provide you with an introduction to reading Spanish. These lessons, which total about one hour, are designed to teach you to sound out words with correct pronunciation and accent. A Reading Booklet to be used with the audio lessons is also included in PDF format. Includes: 30 Audio Lessons (Lessons 1-30) on 16 Audio CDs / User’s Manual / Reading Booklet / Carrying Case.